Jose Cuervo's traditional margarita mix is a non-alcoholic blend that you serve with tequila and ice. Although the margarita mix tastes like limes, it offers none of the citrus fruit's nutritional benefits. 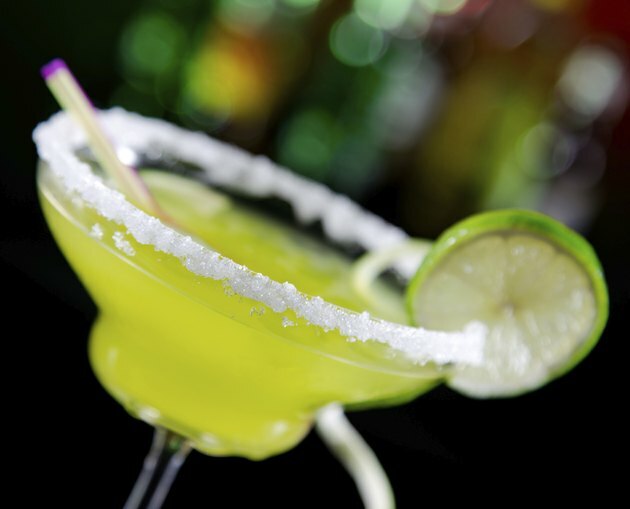 Like many mixed drinks, margaritas tend to be higher in calories than plain beer or wine. A 4-oz. serving of Jose Cuervo Premium Margarita Mix has 100 calories, no fat and no cholesterol. The mix alone contains 3 percent of your recommended daily value of sodium, but serve it in a salt-rimmed glass and the total sodium content will rise. The calories in Jose Cuervo margarita mix come from carbohydrate. Each 4-oz. serving contains 24 g of carbohydrate, all of them from sugars. That's 8 percent of your recommended daily value of carbohydrate. The mix has no fiber or protein. Jose Cuervo's margarita mix is a blend of water and the sweeteners corn syrup and sugar. It contains natural flavors, preservatives, FD&C yellow no. 5 and other ingredients. It has 0 percent juice. By adding 1 oz. of tequila to the margarita mix, you're adding 65 calories, according to the Task Force on College Drinking. Tequila is a hard liquor made in Mexico from the blue agave plant, which is a relative of the lily. Although a basic margarita made from this margarita mix and tequila has about 200 calories, many restaurants serve much larger margaritas that contain 500 or 600 calories. Wine, light beer or sparkling water would be a smarter choice if you're watching your calorie intake.